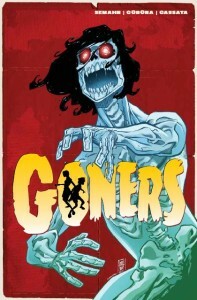 From relatively new creators Jacob Semahn and Jorge Corona comes Goners, a new comic from Image. Goners follows the Latimer family, a family that has been entrusted with protecting the world from various supernatural threats for as long as anyone can remember. What happens, though, when the elder Latimers are killed on live television and their children are left alone and afraid? The Latimers are humanity’s defense against the supernatural. The current generation are Raleigh and Evelyn and their children Zoe and Josiah. When Raleigh and Evelyn are killed on live television, the Latimer children are immediately thrown into turmoil as not only are their monsters out to kill them, but now the press wants to know about their feelings and whether their parent’s reality show is getting renewed for another season. When your life is already weird, things can only get worse. Semahn and Corona make a heck of a debut issue. They mix influences like Johnny Quest and Batman: The Animated Series with serious things like family bonds, death of parents, slight supernatural horror and much more. They’re able to mix small, comedic beats between more serious and sometimes more violent moments, giving them book a slightly hopeful edge, even with all seriousness of the events.Corona’s playful style and the amazing colors by Gabriel Cassata belie just how grim things can get when the responsibilities of centuries worth of family history bear down. It feels like a true collaboration between Semahn and Corona, giving a debut issue that’s as polished as most anything else on the stands. Goners is exactly the sort of comic I enjoy seeing from Image: a team of not-so-well-known creators that are obviously making a book that they love dearly. The love shows through in this issue as it delivers a heck of an opening and grabs the reader in a big way. Fans of Monster Squad and Johnny Quest should find more than enough to love in this first issue and surely even more to love as the story continues. Parental Concern: Moderate. I mean, people are dying, after all. Leo (@LFLJ) talks about comics on the internet a lot. He podcasts, reviews here, and also does regular interviews at Multiversity Comics.